Researchers from the Massachusetts Institute of Technology (MIT) and Australian National University have developed new technology that aims to make the Advanced Laser Interferometer Gravitational-Wave Observatory (LIGO) even more sensitive to faint ripples in space-time called gravitational waves. Scientists at Advanced LIGO announced the first-ever observation of gravitational waves earlier this year (shown at the top of the page), a century after Albert Einstein predicted their existence in his general theory of relativity. Studying gravitational waves can reveal important information about cataclysmic astrophysical events involving black holes and neutron stars. In The Optical Society’s journal for high impact research, Optica, the researchers report on improvements to what is called a squeezed vacuum source. Although not part of the original Advanced LIGO design, injecting the new squeezed vacuum source into the LIGO detector could help double its sensitivity. This would allow detection of gravitational waves that are far weaker or that originate from farther away than is possible now. For millennia, people have used light as a way of viewing the universe. Telescopes magnify what is visible with the naked eye, and newer telescopes use non-visible parts of the electromagnetic spectrum to provide a picture of the universe surrounding us. Researchers from the California Institute of Technology and MIT conceived, built, and operate identical Advanced LIGO detectors in Livingston, Louisiana and Hanford, Washington. Each observatory uses a 2.5-mile long optical device known as an interferometer to detect gravitational waves coming from distant events, such as the collision of two black holes detected last year. Laser light traveling back and forth down the interferometer’s two arms is used to monitor the distance between mirrors at each arm’s end. Gravitational waves will cause a slight, but detectable variation in the distance between the mirrors. Both detectors must detect the variation to confirm that gravitational waves, not seismic activity or other terrestrial effects, caused the distance between mirrors to change. The researchers are planning to add their new squeezed vacuum source to Advanced LIGO in the next year or so. 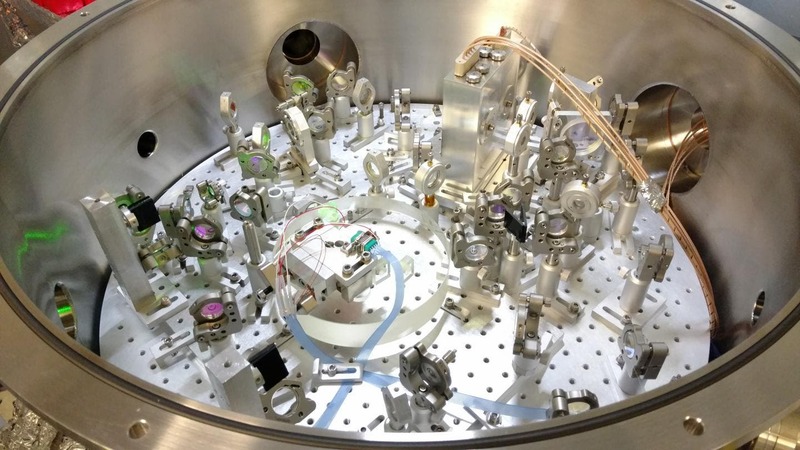 Once implemented, it will improve the sensitivity of the gravitational detectors, particularly at the higher frequencies important for understanding the composition of neutron stars. These extremely dense stars contain the mass of the sun, which has a radius of 700,000 kilometers, within just a 10-kilometer diameter. The improved squeezed vacuum source builds on work conducted by researchers at Leibniz University of Hannover and the University of Hamburg, both in Germany. The new squeezed vacuum source exhibits about ten times less phase noise than previously reported sources. The researchers accomplished this by decreasing vibrations that can adversely affect the squeezed state and by making improvements to a system that corrects any remaining phase noise.